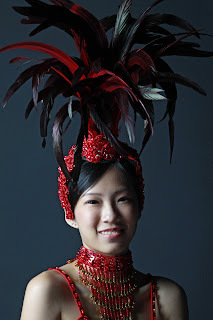 Received some photos from the samba photoshoot. I know you will think of the local movie "881". I thought it was a red pineapple on my head. More photos here. Went for my facial yesterday then to IMM with mum to buy a luggage for my BKK trip next month. Spent $91 on an "American Tourister" luggage and $25 on a TSA lock. Had a peanut butter toast set at the HK restaurant but tasted awful. Took a cab home, prepared and off to an event briefing. Home at 8pm with a tired mind.